Discussion in 'Defence Analysis' started by NKVD, Oct 27, 2016. Gentlemen, with all due respects and admirations all around, I have been persuading @Joe Shearer to start a dedicated thread on Kashmir and request @VCheng and @scorpionx along with @Rain Man to help us understand the matter with clarity and on basis of facts and not the nationalistic jingoism as @Hembo so kindly noted and pointed out. I urge you fine gentlemen to contribute in this aspect, as it is incumbent upon you all, who have dedicated substantial time into researching and collating information and cross referencing the same, to share the knowledge with those of us, less enlightened. may I request you to make a dedicated thread/corner for the same if @Joe Shearer is willing to set the pace and @scorpionx @VCheng and @Rain Man share with us the various insights that they have? zebra7, Hembo, dray and 2 others like this. What a great idea, but my goal all along has been to move the issue forward, and not stuck in the past. While history is very important, it must aid our understanding in ways that help us find a practical solution to benefit us all. Joe Shearer and Inactive like this. Absolutely, may I suggest that historical background on facts, irrespective of the uncomfortable truths both the sides may have to face, in order to make sure that misconceptions are not around, and a segment on - road ahead. Joe Shearer and VCheng like this. There might be a fourth possibility, in my humble opinion. BlackOpsIndia asked similar question in the google group and what I replied to him is the following. So it was our official policy to pursue rulers to accede India on the basis of geographical contiguity and the wishes of the subjects. It was not Pakistan's official policy. Ambiguity started to arise when rumors came of Junagadh's accession to Pakistan on 17th August. So technically, if we rejected the legitimacy of the rulers accession of Junagadh to Pakistan and adhered to the 'will of the state' principle it makes the adoption of similar principle in case of kashmir obligatory, otherwise India's official policy would have been charged of duplicity." PS: BTW, I am just amazed to read one after another masterpieces from you. I am saving them for future reference. Off course, Sir. For me it's a learning experience. A quibble: It is "of course". Off course leads to ships being beached! Hembo, scorpionx, vstol jockey and 1 other person like this. Joe Shearer, VCheng and scorpionx like this. Both requirements can be satisfied. Please let me get my bread-rolls. Just made some roasted vegetables, and need the rolls. Back in 15 minutes. There was no scope for consulting the population. Before coming to the issue of the 'will of the people', let us finish off the quibble. In the case of Junagadh, there is a false symmetry built around the situation of Junagadh and the situation of Jammu & Kashmir; in one, say the system-builders, a Hindu prince chose India, although his subjects were Muslim; in the other, a Muslim prince chose Pakistan, although his subjects were Hindu. QED, case proved. Kashmir was hovering, its prince was undecided and didn't know what to do, until he practically had his throne shot out from under him. The significant leader, Sheikh Mohammed Abdullah, was pro-Congress, was supported by the left in his state, and was close to Gandhi and to Nehru. Junagadh was clear, the prince was decided, and knew very well what to do, because he had been told what to do, by his Dewan, Shahnawaz Bhutto. Two significant things happened after the Nawab's declaration, but first, we need to look at his act of accession. Junagadh acceded to Pakistan, but this was itself illegal for two reasons: one, a legal one; the second, a practical one. The legal bar was that Junagadh was a vassal state of Baroda, and hence had to follow whatever Baroda did. The other corollary to this was that Junagadh in turn had vassals, and their rulers refused to have anything to do with Junagadh's Nawab's decision! The practical bar was, naturally that of contiguity. 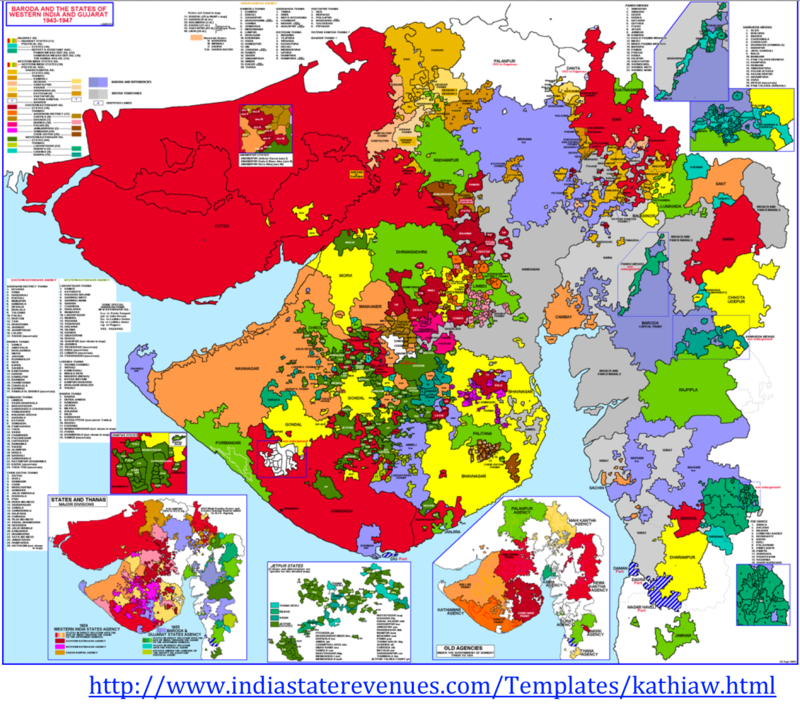 Can you spot Junagadh in the map of Kathiawar? It's the big patch of red down below. scorpionx, Hembo and Inactive like this. There was no scope for consulting the population. These two points are important indeed. Please expand on them as you wish. Let me conclude the Junagadh story by pointing out that the bar to the Nawab's accession to Pakistan was contiguity. When he fled to Pakistan, the Nawab went by boat; soon, his Dewan handed over the keys to a man called Buch, who, all unsuspecting, had been administering a nearby Kathiawari state, when the suddenly found himself dumped with the administration of Junagadh. The accession was followed by two of the Junagadh vassal states objecting to this act of accession and declaring their accession to India. At this point, Baroda, the suzerain state, had acceded to India; her vassal state, Junagadh, had acceded to Pakistan; the vassals of Junagadh had acceded to India. If anyone says Oreo, I shall move heaven and earth to have him (or, preferably, her) banned permanently from this thread. Much is made of India introducing troops into Junagadh, and of making her accession to Pakistan a non-starter by use of force. Actually, this stems from the usual inattention to facts; troops were sent to the two vassal states, at their request, for their protection from the Junagadh state forces. Troops were sent, it might be mentioned, with difficulty; nobody had a clue which patch of land belonged to whom, and how to get from A to B without crossing half-a-dozen state boundaries. NO troops were sent into Junagadh. It was then that Sir Shah Nawaz Bhutto, having realised that the game was up, displayed that sterling flexibility of thought and of quick decision-making that has marked his lineage: he handed over the keys and moved - very fast - to Karachi, to found a dynasty. Let us recall, before going on to great things, that Junagadh had no contiguity with Pakistan, and that no troops were moved in there. The entire matter was conducted in unseemly haste. There is one, no doubt, apocryphal account that insists that when the Nawab was embarking on his final voyage, he ensured that all his pet dogs got on board; there was some reasonable doubt about all female members of his household having boarded. It may be thanks to that act of haste that enabled us, years later, to delight in the acting talent of Parveen Babi. She was of that family. Golden_Rule, zebra7, scorpionx and 3 others like this. That is an important document. A question: Why was August crossed out for October? What delayed the signing for so long once it was drafted? It was delayed because the Maharaja thought That the Pakistani invasion would end because of UN intervention. However Pakistani Forces entered Srinagar by the middle (?) of September and by October the Maharaja thought that J&K was a lost cause and signed it over to India.